Perfect for an on the go breakfast. Blend the macadamia nut milk, bananas, almond butter, and dates in a high speed blender for 1 minute. Remove and place into individual mason jars. This mixture will fill up 4 wide mouth mason jars. Add 2 tablespoons of chia seeds into each mason jar and stir until the chia seeds are evenly mixed in. 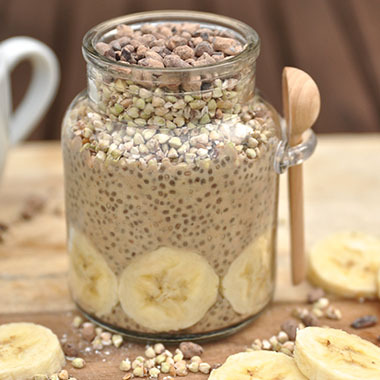 In the morning, remove one of the jars, top with the sprouted buckwheat groats and sweet cacao nibs or add in some sliced bananas. This pudding is delicious plain so the toppings are are optional, but add in an extra protein, vitamins, and minerals.